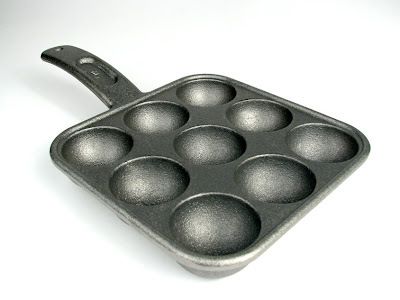 For a few years now I've been fascinated with those infomercials for the "pancake puff pan." You know - the one with the little wells, where if you pour the batter just so and turn it just so and stick something in the middle, you end up with breakfast that looks like a donut but tastes like a pancake. My kids begged me to call the number and get the pan. Never did. The concept, though, was appealing. Then, at the Foodbuzz Blogger Festival in San Francisco last month, I met Chad Gillard, the president of Aunt Else's Aebleskiver. Chad had a demo table at the tasting pavilion and was making these little round pancakes filled with jam, chocolate and other goodies. It looked easy enough. And Chad's company makes its own cast-iron aebleskiver pan in a unique design that sports nine holes instead of the more commonly seen seven - very appealing when you're trying to feed a crowd. So, with Chad's encouragement, I agreed to let him send me a starter kit (pan, turning stick, aebleskiver mix) to play with. And boy, have I been having fun. The pan Chad sent is great. The pancakes don't stick once the pan is properly seasoned, and while the instructions suggest pouring oil into each well before adding the batter, I've been using cooking spray instead with fine results. The turning technique takes some practice, but of course Aunt Else's has thought of everything: They've got a video on YouTube showing just how to turn the little buggers so the pancakes come out perfectly round. As you can see from the mostly round results in the photo above, I think I've got it. Chad also sent over a bag of Aunt Else's aebleskiver mix, which I used for the batches I've made so far.The all-natural mix is made using old Danish family recipe - the story about the Andersen-Henriksen sisters is on the Aunt Else's website if you're interested in the details - using organic wheat flour from the Midwest. You add eggs and water, and that's it. I'm not a huge fan of pancake mix in general, but the results of this one were nice: light, eggy, fluffy. The aebleskivers made from the mix got excellent reviews from my husband, who is notoriously critical and hard to please. That said, I'm a cook, so I'm going to experiment and find a good recipe I can make from scratch. Some of the recipes I've found online call for separating eggs; that's not something I'm likely to do on a regular basis. Others are closer to a regular pancake mix, with buttermilk and baking powder. We'll see. In any case, it seems as though a relatively thin batter worked better for me than a relatively thick batter. So if you, too, are ready to experiment with aebleskiver, or if there's someone on your holiday gift list who likes festive breakfasts, I've got good news. Aunt Else's is offering you a 10 percent discount on purchases from their website or their Foodzie store (www.auntelse.foodzie.com) if you fan or follow them on Facebook, Twitter or FoodBuzz. Just include your fan/follow option(s) and "In Erika's Kitchen" in the "Add special instructions to the seller" section during the checkout process. The starter kit ($52.99) includes the pan, a hot pad for the handle, a package of aebleskiver mix, and a stainless steel turning stick. P.S. 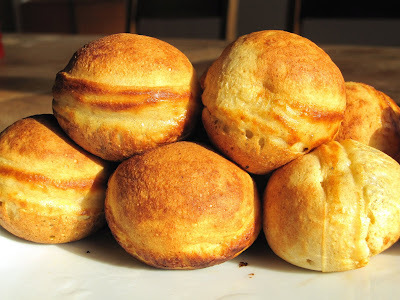 Look who else is writing about aebleskivers - La Fuji Mama, one of my favorite bloggers! She made hers savory and cheesy, which inspired last night's dinner in my house. Yum yum! Fun! I always associate aebelskivers with Solvang. 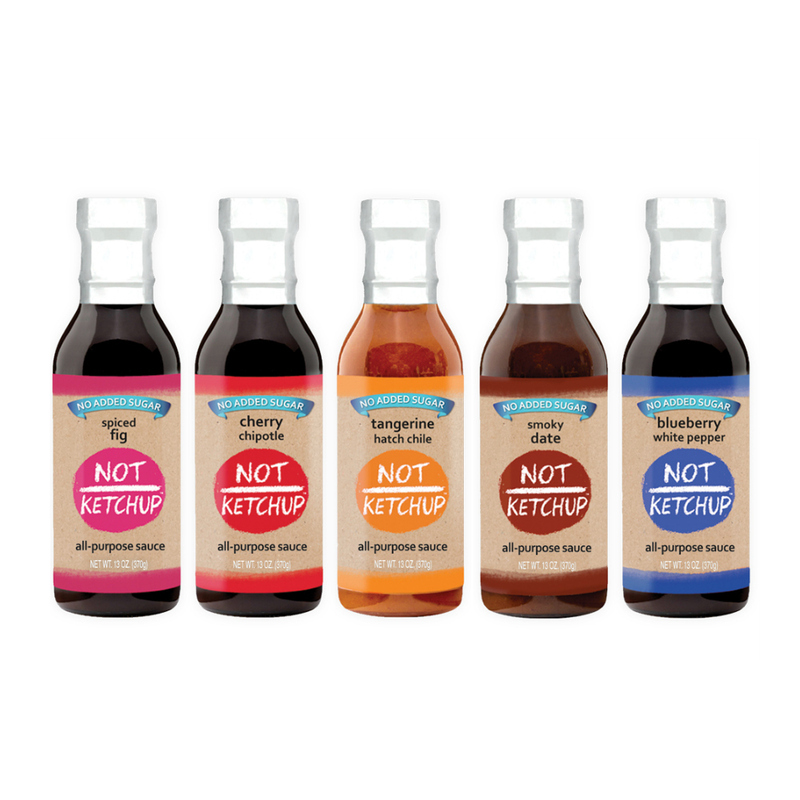 That's funny - someone else mentioned Solvang in the context of aebleskiver yesterday - I've been there, but I hadn't even thought of it while I was experimenting with these. Haven't been to Solvang in years. Maybe it's time. YUM! So glad you've been taught the ways of aebleskivering! Aren't they the best? I love how the possibilities of what you could do with them are practically endless! I'll bet we could have some fun putting various cheeses and perhaps some seafood bits inside those things, too! Great as an hors'deurve. That's what I'm thinking, too - as an hors d'ouevre, making the batter savory by eliminating the sugar, adding a bit more salt, some herbs, some grated Parmesan, and then filling with something else savory: olive tapenade, pesto, artichokes, etc. @DuoDishes - it took some practice. I didn't photography the first batch. Seasoning the pan is a must. I sprayed liberally on both sides with PAM, then baked in the oven. I spray with PAM before each batch, too. No problems releasing the little orbs.